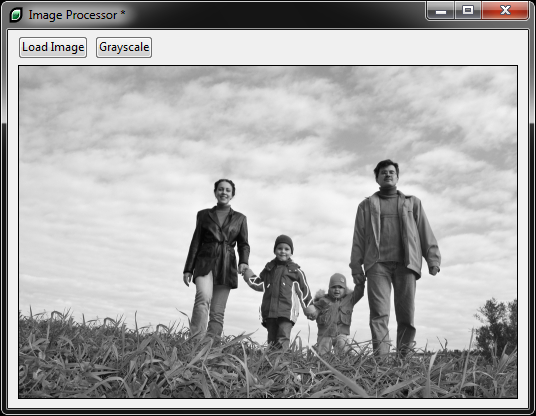 LiveCode LessonsLiveCode LessonsHow To - Step-By-Step Guides To Tasks In LiveCode Using ImagesVision: How do I Convert a Color Image to Grayscale? This lesson describes how to convert a color image into grayscale using widely accepted conversion constants. Sample code and example screen captures are provided. Vision is possibly the most important human sense. It allows us to observe and assess the environment around us with a wealth of color, texture and depth information. We can act upon this information in a seemingly effortless fashion, but the processes that underlie human vision and visual perception are in fact far from fully researched or understood. A lot of computer image processing can and is conducted on gray level pictures as this simplifies the implementation of many algorithms. Gray level images provide a wealth of information but at the same time eliminate the need to handle color channels. Of course there are a number of applications that do utilize color in images. The algorithm described in this lesson converts color images to grayscale by calculating a gray level for each pixel and setting the three color channels for that pixel to the value calculated. This effectively converts a color image to grayscale, but it also allows us to add color to image regions, if we wish to do so in the future. Create a New Mainstack and drag an Image Area onto it. This is the location in which the image will be displayed. Then open the Property Inspector and set the name of the Image Area to Image. You also have to create the custom property cHiddenImageData for the Image Area. This is used in a subsequent lessons in which it is necessary to have a copy of the image that is being updated. answer files "Select the image you wish to load:" with type "JPEG Images|jpg|JPEG"
set the cHiddenImageData of image "Image" to the imageData of image "Image"
This button allows you to open Joint Photographic Experts Group images for processing. Note: Update the type information in the code if you would like to be able to load other image types too. Next: How do you embed an image in a stack so a path reference is not needed? this assumes that an image area with the name "Image" exists on your card. Have a look at the instructions under "Creating the Image Area". You should be able to fix the issue by dragging and dropping an image area from the "Tools" pallet onto the card. The default name of an image area is "Image". I have a few questions regarding the Edge Detection app that you have documented. (a) I have followed your instructions and created the app, however nothing happens when I start it up .. I do not get the prompt to enter or choose an image filename. "You also have to create the custom property cHiddenImageData for the Image Area. This is used in a subsequent lessons in which it is necessary to have a copy of the image that is being updated". However you do not indicate what kind of control it is as well as how to create and embed it into the Image Area. You also mention about subsequent lessons .. please could you clarify this as well. Just follow through all three lessons, keep adding the code to your stack and you should get a working edge detection app. You may also have to lock the size and position of the image area in the Property Inspector. This ensures that images do not automatically resize the image area, when they are loaded. (a) The functionality to load a file is provided in this lesson under "Creating the Load Image Button". I hope this addresses the problem you have been having. How could I make a saturate button? we do not have a lesson on implementing color saturation. If you would like to implement color saturation, then the algorithm in this lesson provides the information you need to access all the pixels and their ARGB values in an image. You will have to implement the algorithm for color saturation yourself and then apply the value changes to the relevant pixels in the image you are processing.